Trained as a teacher, she accepts a job as a governess to the daughter of Noah Becker, a German immigrant lawyer, who is about to enlist with the Rebel army. Then in the spring of 1864, Sherman's troops edge closer to Atlanta. Caitlin tries to escape north with the girl, but is arrested on charges of being a spy. Will honor dictate that Caitlin follow the rules, or love demand that she break them? Can I just start off by gushing about the history! The detail and the events added to the story were fantastic. Jocelyn Green included aspects of the Civil War that aren't touched on by many, and I love that she includes it in her stories. I love stories set during the time of the Civil War. There is so much there. From both the North and the South, there is so much history to work with and Jocelyn takes it and runs with it. She weaves her fictional characters (some based on true people) flawlessly through these historical moments. Caitlin McKae is such a strong lead. She pretend to be a man to enlist in to the the Union army to fight beside her brother, but after being injured and some confusion on the battlefield, she winds up in Atlanta, the hub of the south. She is stubborn to the core, but it helps her persevere as she navigates Atlanta, trying to keep her past a secret to protect her life. Caitlin is a smart woman, not afraid of hard work and is willing to stand up to anyone around her. Noah Becker I thought was a wise character. He is stuck between a rock and a hard place when the war reaches him. Despite his leanings, he joins the Confederate Army. All he cares about is his daughter's safety. His devotion to his daughter was swoon worthy for me. My goodness, how I loved reading about Noah. He does what he has to do and suffers a lot for it, but he is a character you keep cheering for. 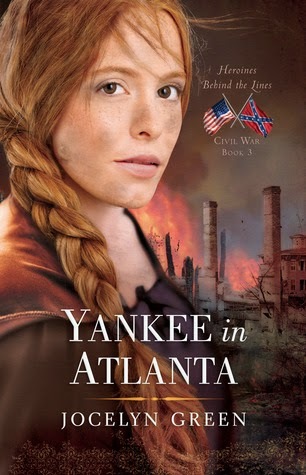 I loved how in Yankee in Atlanta, we got to go back and visit with Ruby from Wedded to War. We were brought up to date, really, on all the characters form the last two books. The connections between the families was fun to see and kept the series connected. We also were introduced to new characters as well, and I have to say, Susan Kent could make Scarlett O'Hara look civil and kind and morally righteous. This story was great. I know most people know about the fall of Atlanta from Gone with the Wind, but really, you don't get the full story. Through Caitlin, we experience everything that happened and how much harder it really was to survive and live during the siege and after. This book captures it all. You see it from both sides perspective and it gave it such depth. This book sounds great! Enjoyed your review and comparisons to Gone with the Wind. I wonder if it would work to start reading with this one or does this series really need to be read in order? Hi Karen, It was a wonderful book! When it comes to Atlanta and the Civil War, it's hard not to compare to GwtW. :-) I would recommend starting with the first book. There are parts of this story that might not make as much sense if you haven't started at the beginning.One main character in this one is also one featured in Wedded to War.